There’s something fascinating about extreme weight loss. Judging by the runaway success of The Biggest Loser and Extreme Weight Loss, not to mention our national obsession with anything and everything that promises shed pounds, I’d say a lot of get easily sucked in to the drama of The Incredible Shrinking Man or Woman. Maybe it’s curiosity about how someone could be the same person inside after such monumental external transformation. Maybe we just want to know what they look like with their clothes off. Maybe our brain can’t wrap itself around the idea of someone shrinking to half their original size. Author Shauna Reid’s weight loss memoir, The Amazing Adventures of Dietgirl, chronicles her journey of doing exactly that–going from 350 pounds to 175 over seven years. 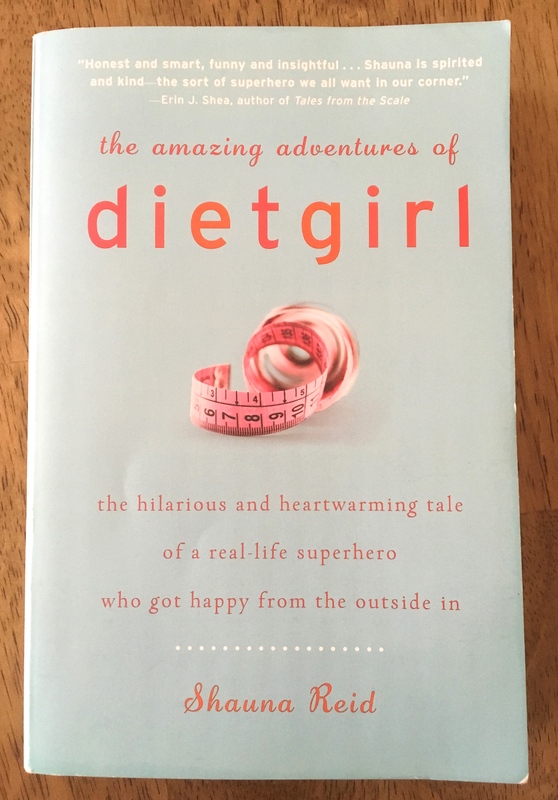 When I finished reading the introduction to The Amazing Adventures of Dietgirl, I turned to my husband and said, “That’s got to be the best introduction to a book I’ve read in a long time”–and proceeded to read the whole thing out loud to him. Any book that opens with the line “I’ve got the biggest knickers in Australia” is probably going to be a winner, if you ask me. And it was. From the introduction on, Shauna Reid’s story proved humorous, heartwarming, and inspiring. I thought I’d share my thoughts on it here, in case any of my blog readers are also book readers. I’ve read a lot on the subject of weight loss–memoirs, nutrition texts, even a book on the psychology unique to thin people. Here’s where The Amazing Adventures of Dietgirl stands out. First of all, it’s hilarious, which I can’t say for the “Energy Balance” section of my Nutrition textbook (or the psychology book, for that matter). Reading it in bed at night, I was giggling to the point of tears, which I haven’t done since reading David Sedaris’ “Six to Eight Black Men” one slap-happy night way past my bedtime. Reid has a wonderful way of making light of her status as what she calls a “lardy lass,” and seems basically like the kind of friend you’d want to split a bottle of wine and a chocolate cake with…or, you know, a salad and some ice water. Still, Reid doesn’t shy away from the seriousness and perpetual struggle of prolonged weight loss. She acknowledges right from the start that her extreme overeating stemmed from an abusive family situation. Having read Andie Mitchell’s It Was Me All Along (another weight loss memoir), it was impossible not to draw comparisons between the two. Where Mitchell’s book was a heavy read that focused to the point of melancholy on family issues that drove her obesity, rather than the buoyancy and joy that came with getting healthy, Reid’s memoir gives a balance of both. Besides the humor in the book, the other virtue of Reid’s story is that her weight loss happened the old-fashioned way: with portion control and exercise. There were no quick fixes or fancy fad diets, no plugs for any special program to bring dazzling weight loss. Just an admirable example of the slow-and-steady-wins-the-race type of loss that any dietitian will tell you is the most attainable and realistic. And ultimately, as Reid plugs away at the process, her weight loss becomes personal gain. In getting healthier, she begins to break out of the shell she had built to confine herself in a lackluster, going-nowhere life. It’s an interesting look at the underlying truth that, usually, excess weight is not just about the weight itself–it’s part of an emotional package deal that affects people’s entire lives. When she chooses to make positive change in her weight, Reid finds the rest of her life following suit. 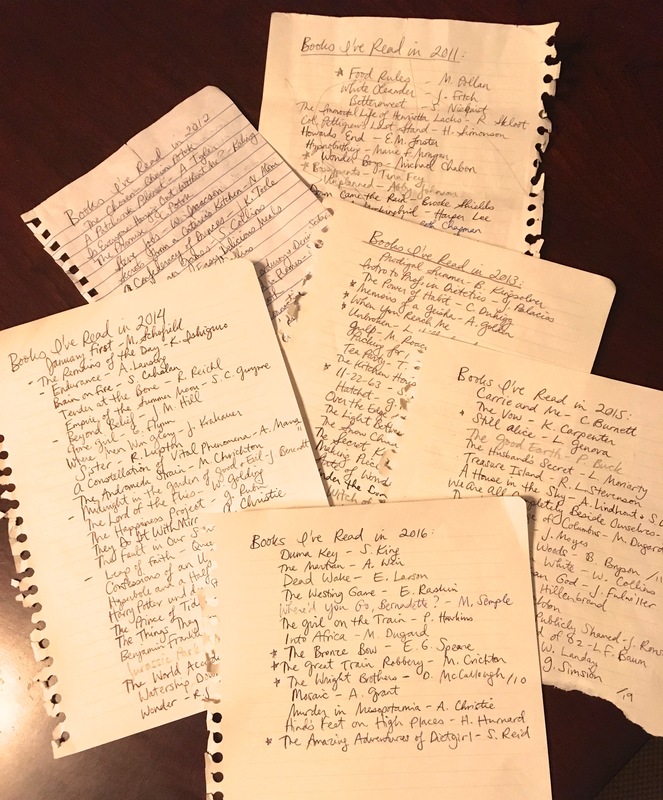 Every year, I keep lists of all the books I read, and will usually go back and star the ones that were the best or that I would confidently recommend to friends. As soon as I wrote this one down, a star went immediately next to it. My only criticisms would be that, at over 400 pages, it does run a bit long, and it contains some foul language. All in all, though, it’s a funny, inspiring pageturner. If someone without an athletic trainer, dietitian, or personal chef can have the tools, the gumption, and the willpower go from morbid obesity to a healthy weight, what can that inspire me to do? See? Starred at the bottom. This entry was posted in Nutrition, Other. Bookmark the permalink.